Please note the PSC Toolbar currently only supports Microsoft's Internet Explorer browser. The PSC Toolbar is a easy way for you to keep track of all of your favorite TeleMates and Sites, and a lot of extras too. Below is a detail view of the PSC Toolbar. By clicking the hidden button (indicated by the red box for display purposes) you can hide all of the toolbar buttons as shown below. Alternatively you may disable the toolbar by selecting View>Toolbars>PSC from the Internet Explorer browser window. To re-enable the buttons simply click the "Enable" button shown on the menu below. 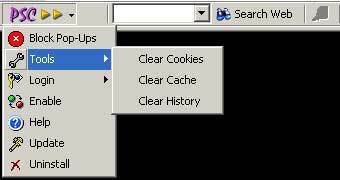 Easy access to clearing cookies, browser cache and history. Although the toolbar automatically updates, you may always use the update button to be sure you have the latest version. Now, for what you are really looking for, convenience. Now you can tell what your favorite TeleMates are up to with just a single click. When one of your TeleMates are available the Favorites icon will appear yellow letting you know with a single glance that a TeleMate is available. By selecting a TeleMate from your Favorites list, you will then be shown their current status and their current status message (if they set one). Now, you will know if they are gone for the night or just for a few moments, no more unanswered calls. Also, for even more convenience, if your TeleMate is available their phone number will appear under their status message. Both Favorite Sites and TeleMates feature one click access to Site homepage and PSC detail page (if available). Favorite TeleMate listings will also have a direct link to the TeleMate's personal page. You have easy access to all PSC categories for both Site and TeleMate listings. 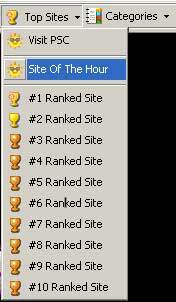 One click access to the Site of Hour and Top 10 ranked sites.